Coachella Music Festival is right around the corner and everyone wants to know what to wear. While many are unable to seek tips from a pro, NOUSzine went straight to the source and covered Coachella style from day to night. LF Robertson’s in-house style expert, Ashley, shared with us on how to take your look from day to night without losing your sense of personal style. Watch as she shares how she styled our girls, Phoenix and Kym in four great outfits. You can’t lose with these tips! 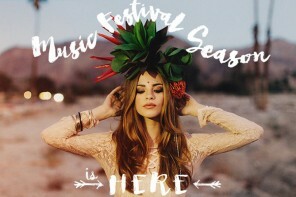 Coachella Style with LF from Nous Model Management on Vimeo. For day, Ashley chose a flirty flower girl look for Kym. Flowers galore but roughed up with a pair of amazing military style boots by Steve Madden. Phoenix’s rocked a bohemian inspired look, including a lace bustier to the aztec print. Kym can’t be missed partying on the field in a neon green beanie, bleached ACDC tee and distressed denim. Phoenix kept her bohemian inspired look going through the night in a dress with aztec print and Steven Madden Thunda boots.